As I thought that the Denizen Pond that came with the Get Famous Expansion Pack could be made more useable for a larger part of the community, I've made a standalone mod of it with 10 new recolors, added more deco slots and changed the light colors that are visible at night. The revamped ponds versions are very great! 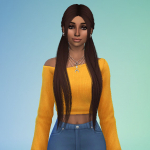 They will be so special for simmers to have in their games! The additions and effects are very nice! Searching for a trash can in disguise, then this Broken Jar trash can might be something for you! Hello The broken jar as a trash can is a great idea! It will blend in with the outdoors environment so very well! It will be great for simmers to use! Thank you for sharing these! Great work! Thanks Rosemow, I hope it will! Thank you very much and you're welcome! A few weeks ago I updated/fixed my Water Reeds + Dragonflies mod, but forgot to let everybody know. The interaction to catch the dragonflies can now be used again. This only works if you have the Outdoor Retreat Game pack.